Our place is a character comfy Bach perfect for 2 couples with two single fold up beds for extra guests for a night or two. 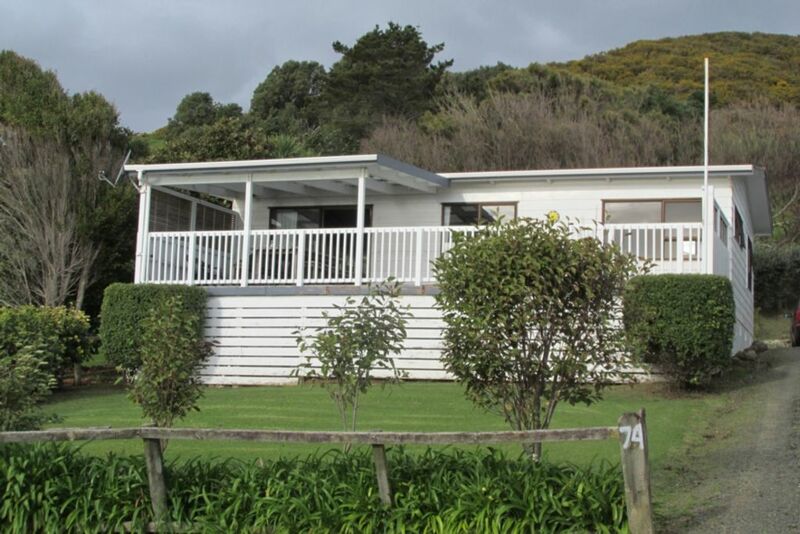 The views from the HUGE front deck are to die for - fabulous sunsets, the ever-changing Hokianga harbour and the remarkable sand dunes on the far side. Half of the deck is covered where we have situated our large outdoor table, perfect for 'al fresco' dining. We also have a smaller deck at the rear of the house to catch the morning sun. Perfect for your breakfast or morning coffee break. We have spacious open-plan kitchen, dining and lounge areas with ranch slider to the deck. There is one bathroom with shower and a separate toilet. The laundry has a washing machine. We supply duvets and pillows for all beds, so just bring your own sheets and pillow cases, as well as bath and kitchen towels. There are extra blankets for your comfort. There is ample parking on the property and room for your boat too. It is a short 3 minute walk to the beach, where swimming is possible at all tides, its a bit pebbly so bring your swimming shoes! A further short 5 minute walk will take you around the corner to the HUB of Opononi - the general store and Info centre, the wharf (where the boats depart to take you across to the sand dunes), the great fish and chip shop, and the Pub. A great venue for entertainment and superb pizzas. Amazing Thai cafe. The heads of the harbour offer wonderful views, interesting walks and fascinating rock pools to explore. Of course, there is excellent fishing in the harbour, we can testify to that. There are many beautiful bush walks in the area; we have all that information in the bach for you. Smoking allowed outside only. No Pets. We have basic pantry items for your convenience, but please replace any you use. Occupancy is strictly for the number of persons stated in the booking request. No Tents or Open Fires. After wet weather, no parking on the grass please. A deposit of 50% is required to secure your booking and the balance to be paid one month before the rental date. A $100.00 cleaning bond is required with final payment, and is refunded if the bach is left as found. NOTE: If you Clean the house to our requirements and bring your own linen (towels/sheets/tea towels) we will refund the bond. We had a great stay ,short walk to shops and the beach from the property. Great views from the deck while enjoying an evening meal. Great place to stay, wonderful views and close to beach and shops. This was our second trip to the Bach and was as wonderful as the first time. Well equipped and comfortable with fabulous views. We will definitely be back! Our staying this batch was fantastic. Location is good, too. Just walking distance to the town. So handy. We had an amazing time in Opononi. We loved our stay at the Hoanis Kiwi Bach. Amazing place to hang out and enjoy the views.